Recently, I’ve taken to browsing through the book sections of my favorite thrift and consignment stores. Quite often, I find copies of bestsellers in both paperback and hardcover that I wouldn’t mind purchasing for my home library, but those aren’t exactly what I’m looking for. 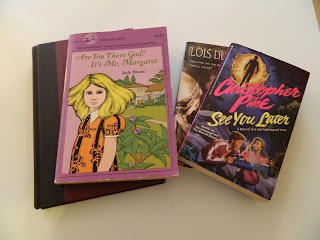 In the past year, I’ve revisited a love of writing and reading children’s literature, and part of that rediscovery includes searching for copies of the books I read and loved as a teenager. My journey started when my daughter started reading more advanced middle-grade books, and it hit me that I could probably write one of my own with a little research. I began scanning the juvenile fiction shelves at the library, where I picked up the vaguely familiar Bridge to Terabithia by Katherine Paterson. After spending a tear-filled afternoon reading it, I was hooked. I whooped with joy when I found a used copy of Are You There God, It’s Me Margaret? by Judy Blume at the local Habitat for Humanity ReStore. (I hid that one away for now, as my 9-year-old daughter is not quite ready for the subject matter yet!) It even had the same cover I remember from reading it as a child. I posted a photo of my find on Facebook and it sparked many comments from girlfriends, who all had a personal connection with the book. The first e-book I bought on my new Kindle a few weeks ago was Daughters of Eve, written by one of my all-time favorite authors, Lois Duncan. Daughters of Eve was one of the only books of Duncan’s I had never read, and I was surprised to find out that it had been updated to have a more modern feel, as have many books in her catalogue of titles. When I was a teenager, I had stacks of paperback books by both Duncan and Christopher Pike, my two favorite suspense YA authors, along with a weathered complete collection of the Trixie Belden mystery series that my grandmother discovered in storage and gave to me. I carried them all with me for years, but somewhere along my many moves they were lost. It makes me sad to think that I probably donated them, not knowing how much I would want them back one day as I pursued my dream to become a published novelist. I’m not sure why I’ve been feeling such a sense of nostalgia regarding these lost books lately. It might be because I first dreamed of becoming a writer while reading those treasured books, and after their loss, I spent many years thinking that becoming published wasn’t in the cards for me. Now that I’m finding success as a writer, the memory of all those stories continues to provide me with hope and inspiration, so I’ll keep looking for my old favorites in secondhand bookstores every chance I get. Who were some of your favorite young adult authors? Reading was often my lifeline in my awkward adolescent years. I gobbled up any books I could get my hands on. I remember reading through "The Wrinkle in Time" series, and yes, anything by Judy Blume, I also remember reading Paul Zindel's "The Effect of Gamma Rays on Man-in-the-Moon Marigolds" and the voice in that book resonating with my teenager self. Great reads that you've all mentioned! It's been interesting seeing my own daughters read and enjoy them too. My 8th grader reads edgier stuff ( e.g. Go Ask Alice and a few others are on her bedside table now), so that gets a little weird. Anyway, thanks for your post Renee and welcome to blogging for the Muffin! I LOVED Christopher Pike books. I went to the library a year or so ago and checked out one of his books. I hoped it wouldn't seem babyish and badly written now that I have decades of reading to compare them too. His book wasn't as scary as I remember, but it was still entertaining! In third and fourth grade, I read every Nancy Drew book. By junior high, I must have been way ahead of my time. I was reading To Kill a Mockingbird and The Cosmo Girl's Guide and Gatsby. I never read YA until I my college Teaching English methods class in the early 80s.